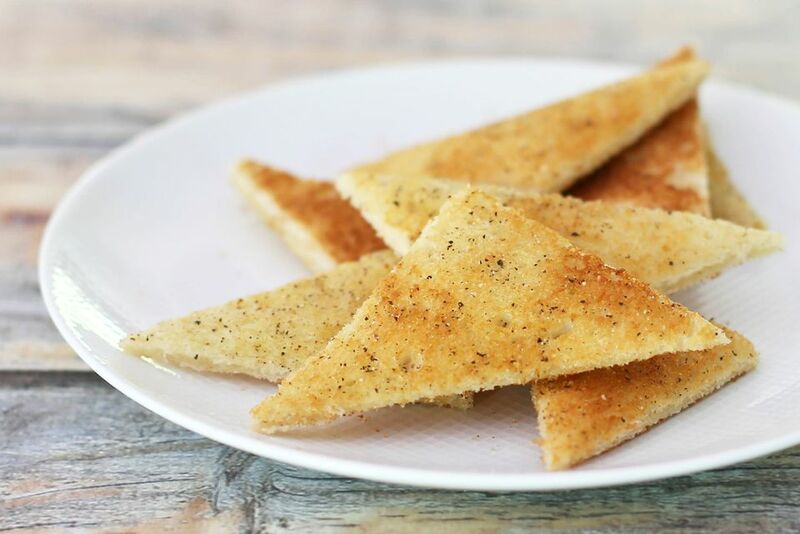 These toast points make the perfect base for creamed dishes, such as a shrimp or lobster Newburg, chicken a la king, creamed eggs, or seafood au gratin. This is a good, basic recipe you'll make again and again. Heat the broiler (500 F or High) and position the top rack about 6 inches from the broiler heat source. Arrange the bread on a large baking sheet. Brush the top of each slice of bread with melted butter, then sprinkle the slices lightly with salt and freshly ground black pepper. Broil for about 1 1/2 minutes on the buttered side, or until golden brown. Flip and brown the other side for about 1 1/2 minutes. When the slices are cool enough to handle, trim the crusts and slice each into 2 triangles. Alternatively, you may cut the toasts in two rectangles or leave as large squares. Serve them as a base for chicken a la king, creamed eggs, lobster Newburg, or other creamed dishes. Nature's Own Butter Bread" or "Pepperidge Farm Farmhouse Hearty White Bread" are both good choices or use your favorite full-size loaf bread.